The RP Photonics Buyer's Guide contains 4 suppliers for interlocks. An electrical contact may be installed at a door, such that people entering that door are protected. Similarly, contacts may be attached to laser enclosures, covers and blinds. A light curtain or an infrared detector may be used to monitor the presence of persons in a designated laser area. A people counter at some entry can fulfill the same purpose. It counts the persons entering or leaving the dangerous area. Once and interlock has been triggered, it will usually require a manual reset for resuming operation. For example, it would be inappropriate to block a laser beam only while a door is open, automatically releasing it again when it is closed. Interlock functions may be built into a laser controller, but there are also separate interlock devices which can be connected to laser controllers. In case of failure of a beam shutter (which may be monitored with an additional optical sensor, for example), it should take appropriate measures. Being highly relevant for laser safety, interlock devices are subject to various laser safety standards. The planning of safety installation, including any interlocks, should be done by personnel with detailed experience in laser safety. Some suppliers of interlock devices also offer laser safety consulting. As interlocks can be annoying in real life, they are often manipulated, particularly in research labs. 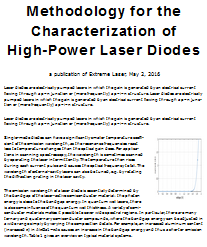 Therefore, their usefulness for laser safety should not be overestimated. Many of them have a key switch, so that they can be operated only by an authorized user, having the key. In other cases, authorization is done by entering a code on a numerical pad or with a swipe card. Some devices allow authorized users to override the interlock under certain conditions (“defeatable access controls”). Laser interlocks may be combined with access control systems, which can prevent unauthorized persons to enter certain sensitive areas. It may be desirable to physically prevent unauthorized access instead of blocking laser beams, if the latter could seriously affect operations. However, there should still be a fail-save method of entering the room in emergency situations, without requiring keys or key codes which may not be immediately available in an emergency. An interlock can have one or several built-in electronic drivers for beam shutters. Laser warning lights may be connected, which are automatically turned on when the laser beam is active.